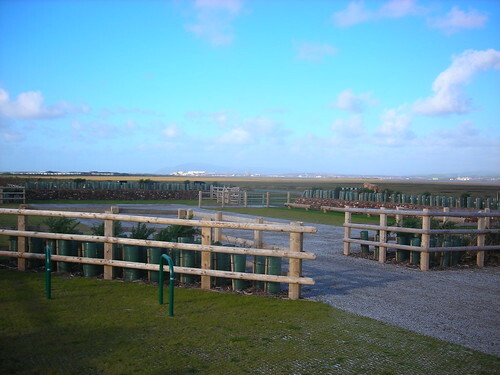 We’re still within the boundary of the old County Borough of Barrow, but the town looks far off from here, the car park of the South Walney bird reserve. This is some 10 km south of the Walney Bridge, along a narrow winding lane with a surface not always as good as the best bits. And with the added threat of caravan-towing cars hurtling up the lane the other way. I was down there 2 months ago and glad to say the weather was sunny but windy, in contrast to the rest of the month !! I was last down there September 1972 and accessibility has improved greatly. Then it was a case of going to the Town Hall to obtain an address of a guy in Portsmouth Street who was the custodian of the permits. He was never in and domestic telephones being relatively rare in those days you could never contact him. Anyway it was worth the effort and then and now it was a memorable day. The place still has an unspoilt wilderness feel to it although it is very close to habitation, including the enormous caravan site which wasn’t there in those days. What sort of birds might one find there? I refer my honourable friend to the entry I made two days earlier. I was wondering if you have a particular favourite? Actually that board is a bit deceptive as it doesn’t mention the gulls. The reserve is summer home and nesting site to thousands of gulls, mostly lesser black-backed gulls which I think are a purely European species. Also herring gulls which are pretty well universal and great black-backs which are big mean bastards. I like the gulls because they seem to fly for the sheer joy of it, surfing on the wind as it were. There’s also lots of waders which you can see all along Walney, both sides. I like the oystercatchers and the curlews best. The flocks of dunlin are lovely too when they take off all at once and swirl in the air, changing colour as they turn.